A week or two ago I stopped at a local tint shop to get a quote to tint the windows. 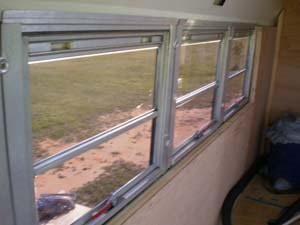 They needed all the measurements so I came home and measured all the windows and called them with the measurements. They called me back the next day with the quote. Are you ready for this???? And the magic number was: $1,800. That was more then I was expecting. I got online and found www.windowtint.com. 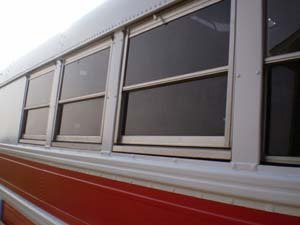 I was able to buy ALL the tint I needed for the bus for much, much less. See my invoice below for details and dimentions. I was not able to install my A/C unit today because it needs the mounting gasket that sits between the unit and the roof. I have one ordered so I will have to wait untill it gets here. I decided to go ahead and try my tiniting skills out. 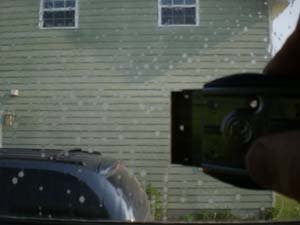 Now any pro tinters reading this will probably not like the way we did it but it worked the best for us. 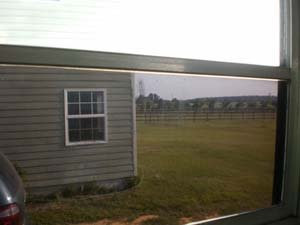 First, we brought all the tint inside the house out of the 100 + degree, 100% humidity heat. I meassured the glass to know the exact messurments we needed. My wife has a circular cutting tool and cutting pad that she uses for quilting so we used that to cut the tint. We used this to cut all the tint for the side windows. 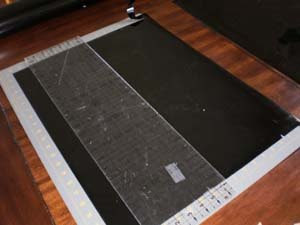 After she cut each piece I would do the easy work and round the corners. Rounded corners will last longer then square corners. 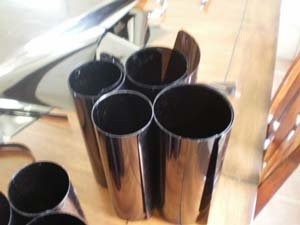 Here are the finished cut pices ready to go on the windows. Next I had to venture back out into the blistering heat and begin the application of the tint. 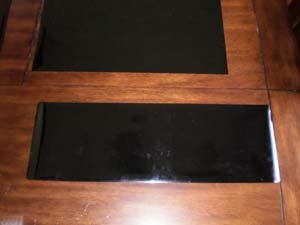 First you need your water soap solution for the cleaning and application of the tint. Take any spray bottle and add about a cap full of Joy dish soap and fill the bottle with water. 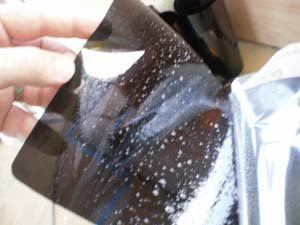 Step 1: Spray down the glass surface. Take a razor and scrap the glass down removing any and everything on the glass. Thoroughly wipe the glass down removing all debris. Just to be safe spray the glass down again and scrub it. 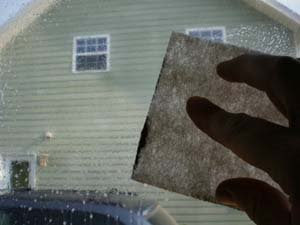 Start to peel the protective layer off the tint to expose the sticky side. 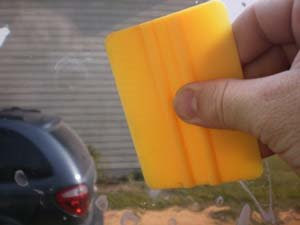 As you are peeling off the protective layer (Don't let it get into any dirt) spray the sticky side of the tint liberally with your soap solution. 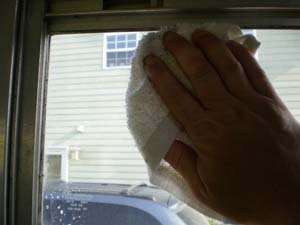 Once your tint is all soapy spay the glass as well. Apply the tint to the glass. 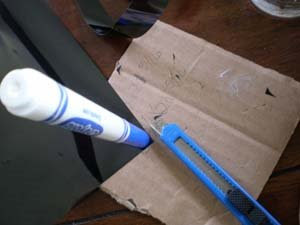 Now take your smoothing tool and slide it from the center towards the edges removing any water between the tint and the glass. I found it helpful to spray the surface of the tint and run the smoothing tool over it again to make sure that you got all the air bubbles and water out. Another tip for the amateurs. 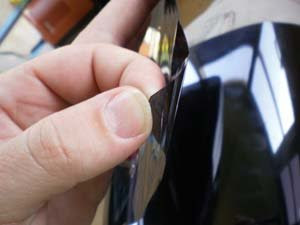 (Like myself) When you cut your tint make sure and leave a small gap at each edge. If you don't the tint will buckle and be about impossible to install. I also installed the 38% tint on the front windows. 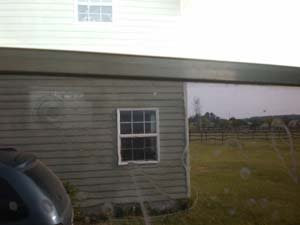 The first window I did was a nightmare because the edges of the tint were touching the window trim. I ended up ripping it off and redoing it. 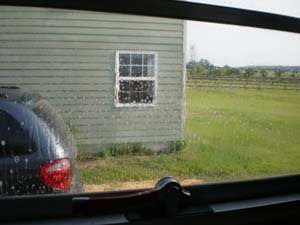 The second time I did it I made sure there was a small gap all the way around the window and it went on perfect. Looks good too! I only have 5 windows to go and the bus is tinted. 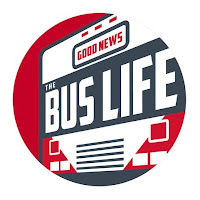 I probably will not be back on the bus until Wednesday. See ya then! This is amazing and just what I needed to see ! !